Tom Jones was one of the legendary independent record producer Joe Meek's 'wannabe's and called himself Tommy Scott. Despite some initial singles cut at Joe's famous Holloway studio that were never released, this part of Tom's career drew little attention at the time. With his group called the Senators, his style was closer to American rock and roll than it would become. After returning to Wales, Tom decided to place himself under the management of fellow Welshman Gordon Mills who up until then had been a singer with the moderately successful 'Viscounts'. Even after gaining a contract to record with Decca things didn't change until the smash hit 'It's Not Unusual'; a song originally intended for Sandie Shaw, co-written by Mills with Les Reed. This was the second attempt at the charts by the renamed singer and his group who had also changed their name to the 'Squires'. This one single was to forge the path of his whole career. The style was neither rock and roll, nor 'MOR', but somewhere in between. He could therefore capture record buyers across a broad spectrum without becoming stereotyped as belonging to one musical genre or another. This formula worked well although, like most singers, he gradually pushed himself nearer to 'MOR', and finally 'country', as his audience matured. Tom Jones had three EPs released in the UK during the 1960s- only "On Stage" is particularly easy to find now; with a sleeve picture showing the singer's back! 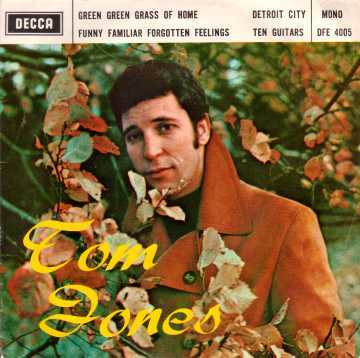 The most sought after of the other EPs is "Tom Jones" which- unusually for an EP bearing the artist's name as its title- is the most difficult of all to obtain. However, the EP cover displayed here isn't a UK issue at all, but does have quite a decent picture of the singer in his youth. This particular issue actually first saw the light of day in Hong Kong. Judging by the fact that I've seen this EP on a number of occasions, there must have been quite a few people in the far east during 1966 who were longing for the green grass of home. By the early 1970s, with a huge international following, Tom moved himself to the USA and spent his time performing in expensive cabaret venues like those in Las Vegas. He would spend most of the next twenty years playing this role of international 'Super Star' before returning to the enthusiasm of his original audience in the UK. Columbia SEG8464 1966 "Tom Jones"
Decca DFE8668 1966 "What A Party"